I live for stories like this. My children are regularly subjected to garage and estate sales. They tap their feet and emit long, angsty, teenage sighs as I go through ancient, musty-smelling boxes, looking and hoping for such a gem. It happened to someone. 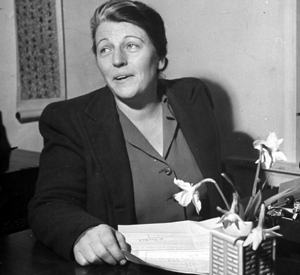 After forty years, an unpublished manuscript by Pearl S. Buck has been discovered in a Texas storage unit. The New York Times reports that the manuscript was returned to Buck’s family “for a small fee.” How the manuscript came to be in Texas is a mystery; Buck, a West Virigina native, never lived in Texas, nor did she have family in Texas. Although Buck’s best-known work today is The Good Earth, in the early twentieth century, many of her other works were widely read. A prolific author, Buck wrote dozens of novels, works of non-fiction, and short stories. In 1938, she was awarded the Nobel Prize in Literature, the first woman upon which the honor was bestowed. The publisher, Open Road Integrated Media, says the novel will be released on October 22, 2013, in both paperback and eBook formats. Everything you’ve stated here makes lots of sense. It seems like what Shaun Black is saying on the issue. Have you read his stuff?